boost::base_collection does not have a push_back member function like, say, std::vector, as the order in which elements are stored cannot be freely chosen by the user code —we will see more about this later. The insertion mechanisms are rather those of containers like std::unordered_multiset, namely insert and emplace with or without a position hint. Elements are not created with new but constructed on the stack and passed directly much like one would do with a standard non-polymorphic container. Elements inserted into a boost::base_collection (or the other containers of Boost.PolyCollection) must be copyable and assignable; strictly speaking, they must at least model MoveConstructible and either be MoveAssignable or not throw on move construction. This might force you to revisit your code as it is customary to explicitly forbid copying at the base level of a virtual hierarchy to avoid slicing. Overlaid messages, such as scores, modelled as std::strings. which we fill with suitable adaptors for sprites, std::strings and windows, respectively. Lambda functions allow for a particularly terse code. Here we just touch on the bare essentials of Boost.TypeErasure needed to present boost::any_collection. The reader is advised to read Boost.TypeErasure documentation for further information. After measuring the performance of the latest changes, we find that rendering is too slow and decide to refactor once again: if we could store all the entities --sprites, messages and windows-- into one single container, that would eliminate a level of indirection. The problem is that these types are totally unrelated to each other. [pop-up 1],[pop-up 2],juggernaut 0,goblin 1,goblin 3,warrior 2,"stamina: 10,000","game over"
As was the case with boost::function_collection, this container is similar to a std::vector<boost::type_erasure::any<Concept>> but has better performance due to packing of same-type elements. Also, the value_type of a boost::any_collection<Concept> is not boost::type_erasure::any<Concept>, but a similarly behaving entity . In any case, we are not accessing sprites through an abstract sprite& anymore, so we could as well dismantle the virtual hierarchy and implement each type autonomously: this is left as an exercise to the reader. Unexpectedly, this piece of code throws an exception of type boost::poly_collection::unregistered_type. What has changed from our original code? Suppose a warrior has been created by make_sprite. The statement c.insert(*make_sprite()) is passing the object as a sprite&: even though boost::base_collection is smart enough to know that the object is actually derived from sprite (by using typeid()) and slicing is to be avoided, there is no way that a segment for it can be created without accessing the type warrior at compile time for the proper internal class templates to be instantiated . This did not happen in the pre-refactoring code because objects were passed as references to their true types. Once T has been registered into a polymorphic collection, it remains so regardless of whether objects of type T are stored or not, except if the collection is moved from, assigned to, or swapped. begin|end(typeid(T)) return objects of type local_base_iterator associated to the segment for T. These iterators dereference to the same value as regular iterators (in the case of boost::base_collection<base>, base&) but can only be used to traverse a given segment (for instance, local_base_iterator's from different segments cannot be compared between them). In exchange, local_base_iterator is a RandomAccessIterator, whereas whole-collection iterators only model ForwardIterator. The observant reader will have noticed that in order to access rank, which is a member of warrior rather than its base class sprite, first (or x in the range for loop version) has to refer to a warrior&, and this is precisely the difference between local_iterator<warrior> (the type returned by begin<warrior>()) and local_base_iterator. local_iterator<warrior> is also a RandomAccessIterator: for most respects, [begin<T>(), end<T>()) can be regarded as a range over an array of T objects. local_iterator<T>s can be explicitly converted to local_base_iterators. Conversely, if a local_base_iterator is associated to a segment for T, it can then be explictly converted to a local_iterator<T> (otherwise the conversion is undefined behavior). 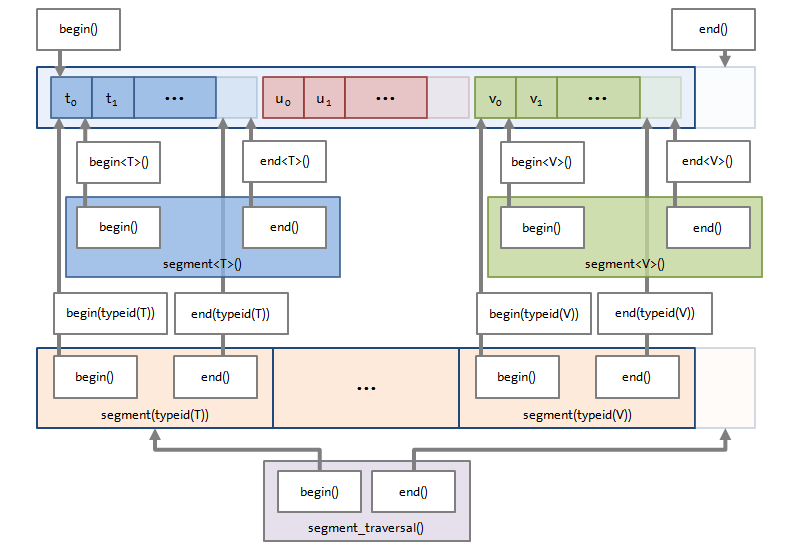 Segment decomposition of traversal loops forms the basis of improved-performance algorithms. If there is no segment for the indicated type (here, goblin), one is automatically created. This is in contrast with the rest of segment-specific member functions, which throw boost::poly_collection::unregistered_type. instructs every existing segment to reserve 1,000 elements. If a segment is created later (through element insertion or with type registration), its capacity will be different. Unlike standard containers, collection-level capacity() and max_size() are not provided because their usual semantics cannot be applied to Boost.PolyCollection: for instance, capacity() is typically used to check how many elements can be inserted without reallocation, but in a segmented structure that depends on the exact types of the elements and whether they are registered or not. throw boost::poly_collection::unregistered_type? As it happens, in the special case where the inserted range belongs to a polymorphic collection of the same type, registration is done automatically . Note the naming here: emplace_hint is used when the position is indicated with a regular iterator, and for local iterators it is emplace_pos. The situations in which the first is raised have been already discussed; let us focus on the other two. The first insertion works because the elf object passed is temporary and can be moved into the container, but the second statement actually needs to copy the elf elements in c to c2, hence the exception. The potentially surprising aspect of this behavior is that standard containers signal this kind of problems by failing at compile time. Here we cannot afford this luxury because the exact types contained in a polymorphic collection are not known until run time (for instance, if elf elements had been erased before copying c to c2 everything would have worked): basically, the deferral of errors from compile time to run time is an intrinsic feature of dynamic polymorphism. The above is unremarkable once we notice we have not defined operator== for any sprite. The problem may go unnoticed for quite some time, however, because determining that two polymorphic collections are equal (i.e. all their non-empty segments are equal) can return false without comparing anything at all (for instance, if segment sizes differ), in which case no exception is thrown. Operators for <, <=, > and >= comparison are not provided because segment order is not fixed and may vary across otherwise identical collections. The situation is similar to that of standard unordered associative containers. These three are all the intrinsic exceptions thrown by Boost.PolyCollection. The implication is that if a type is CopyConstructible, MoveAssignable (or move construction does not throw) and EqualityComparable, then the entire interface of Boost.PolyCollection is unrestrictedly available for it . The ultimate purpose of Boost.PolyCollection is to speed up the processing of large quantities of polymorphic entities, in particular for those operations that involve linear traversal as implemented with a for-loop or using the quintessential std::for_each algorithm. is expected to increase performance due to better caching and branch prediction behavior. But there is still room for improvement. whereas in the second version, iteration on the inner loop, where most processing happens, is a simple increment-and-check operation, that is, there is one less check (which happens at the much shorter outer loop). When the workload of the algorithm (the actually useful stuff done with the elements themselves) is relatively light, the overhead of looping can be very significant. In fact, variants are given of most (though not all) of the algorithms in <algorithm> among those that are compatible with polymorphic collections . Check the reference for details. Behaviorwise this code is equivalent to simply executing std::cout<<r<<"\n", but when type restitution succeeds the statement std::cout<<str<<"\n" is skipping a virtual-like call that would have happened if r were used instead. From a general point of view, supplying the compiler with extra type information allows it to perform more optimizations than in the abstract case, inlining being the prime example. juggernaut 7,goblin 1,goblin 3,goblin 5,"stamina: 10,000","game over"
A list of types is provided as template arguments to the algorithm. This is an indication that the types may be actually present in the collection, not a promise. Also, the list of types need not be exhaustive, that is, some unlisted types could be present in the collection —in the example above, the loop traverses all elements (including std::strings and windows), not only those corresponding to restituted types. In general, the more types are restituted, the greater the potential improvement in performance. The lambda function passed is a generic one accepting its argument as const auto& . Internally, boost::poly_collection::for_each checks for each segment if its type, say T, belongs in the type restitution list: if this is the case, the lambda function is passed a const T& rather than the generic const boost::any_collection::value_type&. For each restituted type we are saving indirection calls and possibly getting inlining optimizations, etc. As we see in the performance section, the speedup can be very significant. If the concrete class is marked as final, the compiler in principle has enough information to get rid of the virtual function call. Other than this, devirtualization capabilities may be able to figure out that the type restitution scenario is actually casting the element to its true type, in which case, again, virtual calls are not needed. Note that all sprites come into one segment: this is why goblins #1 and #3 are not adjacent. Exercise for the reader: change the code of the example so that sprites are further segmented according to their concrete type. Except when small buffer optimization applies. Actually, it is boost::type_erasure::any<Concept2,boost::type_erasure::_self&> for some internally defined Concept2 that extends Concept. If this is conceptually difficult to grasp, consider the potentially more obvious case where warrior is defined in a dynamic module linked to the main program: the code of boost::base_collection, which has been compiled before linking, cannot even know the size of this as-of-yet unseen class, so hardly can it allocate a segment for the received object. That is, Boost.PolyCollection has enough static information to do type registration without further assistance from the user. Provided, of course, that the type has the right to be in the collection, that is, it is derived from the specified base, or callable with the specified signature, etc. For any other type of iterator, it is guaranteed not to compile. For example, algorithms requiring bidirectional iterators or a higher category are not provided because polymorphic collections have forward-only iterators. This requires C++14, but the same effect can be achieved in C++11 providing an equivalent, if more cumbersome, functor with a templatized call operator.